With these powerful novels getting even more popular as the movies hit the cinemas, the call for a Christian response is strong. What values and ideas do Meyer’s novels promote? What is good about them, and what deserves closer inspection? 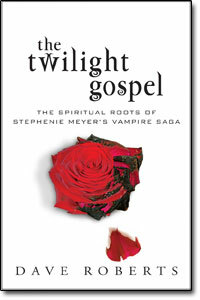 The Twilight Gospel by Dave Roberts is an overview of the different ideas and values that Stephenie Meyers’ Twilight Saga promotes. Roberts identifies different themes throughout the Twilight books and examines them from a Christian perspective. This book was a really quick read. I finished it in a couple of hours, with tv and dinner breaks. I was interested in it because I like to read books about books, as I think it helps me think about the source material in new and different ways. I also have an interest in what people think about “controversial” books, because book banning really boils my blood (say that three times fast). The Twilight Saga has come under attack because of its theme of vampires and werewolves, but is it really all that bad? In short, no. Roberts points out that though the Twilight books promote consumerism (think of Alice’s shopping habits), physical beauty, and the idea that the combination of these things are equivalent to perfection, there are also “good” themes throughout, such as Carlisle’s kind nature and Angela’s rejection of the shallowness of her schoolmates. I think this is a good book for parents who might be questioning whether or not to let their teenagers read the Twilight series, but as an adult reader of the series,The Twilight Gospel did not bring forth new material or ideas for me. It does, however, contain some interesting discussion points that would be fun to chat about with other fans.